Spencer began performing in New York City clubs at age 18. “I was in the right place at the right time, and often got to play with musicians far more experienced than I, who became my professors. I always carried a notebook”. 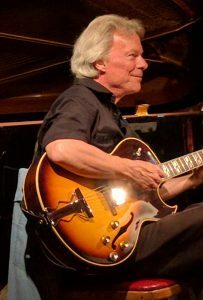 Spencer is the guitarist on Phil Wood’s big band recording, A New Celebration and plays with the Water Gap Jazz Orchestra every month at the historic Deer Head Inn in Delaware Water Gap. He has also recorded several soundtracks for Bob Dorough’s School House Rock educational series. He appears on two albums with pop singer/songwriter Nellie McKay (who is an alum of the CotaCats!) and has recorded eight albums with his marital partner of 40 years, bassist, vocalist, Nancy Reed and one solo album. Spencer has been the guitar and jazz lab instructor at Blair Academy in Blairstown, NJ. for over 15 years and has conducted student orchestras for Notre Dame’s elementary, junior high and high schools in East Stroudsburg, Pa. for over 10 years. He is also the music teacher at the new Summit School of the Poconos, in Bartonsville, Pa. and maintains a busy schedule of private students. As well as performing in many jazz festivals, including the Sacramento Jazz Jubilee, the Bix Beiderbeck Festival, San Juan Islands Jazz Festival, Veritas Tribute to Friends of Charlie Parker, the Cancun Jazz Festival, the Red Nichols Jazz Festival and on the Delta Queen in New Orleans, Spencer has played in all 39 annual Delaware Water Gap Celebration of the Arts Jazz Festivals.